AstroNova company TrojanLabel announces the release of the Trojan T2-C, a high capacity desktop digital label press that combines high volume production with the precision of a digital press. By delivering consistently high volumes in 24/7 production operations, the new Trojan T2-C creates new opportunities in the label printing industry for brand owners, print shops and smaller label converters looking to add high resolution colour inkjet labels to their portfolio. Key features of the Trojan T2-C digital label press include a compact 120cm² footprint ensuring a perfect fit in printing departments of any size; superior print resolution of up to 1600 dpi making it suitable for commercial use and professional labelling; print width of 2” (50.8mm) to 8.8” (223mm) allowing labels to be printed in multiples or as one large label in a print run; and impressive print speed of up to 300mm/sec (12 ips), enabling users to generate extremely large runs in a short period of time. 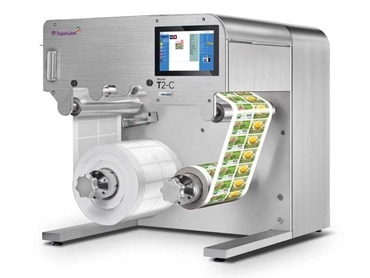 The Trojan T2-C uses a 7” colour touch screen to control the software, simplifying placement of labels on pre-die cuts in perfect registration, and also provides a cost calculator for reviewing operating costs. Designed for self-maintenance, the T2-C automatically performs preventive print head cleaning using an innovative aerosol extraction system that keeps the area clean for even longer printing. Key benefits of the Trojan T2-C digital label press include straight-feed, short web path feature allowing for precision printing and waste elimination; servo-driven web handling and tension control system for perfect media control; dynamic web guide with servo-controlled unwind and rewind shafts delivering high-precision registration, and enabling full bleed printing on pre-die cut labels and tight, finished rolls; advanced ink set and print head combination optimising print head life and reducing ink consumption, thereby lowering cost of operations; and high capacity ink tanks for uninterrupted operation during high production run cycles. Simple to set up and operate, the T2-C installs in 20 minutes with self-aligning tension control and no manual adjustments required. The T2-C is an ideal desktop label printing solution designed to give both owners and users peace of mind with the perfect combination of ease of use, precision, quality and reliability. The Trojan TC-2 compact digital press complements Metromatics’ existing range of desktop digital label printers, the Kiaro and the QL-800. AstroNova is represented in Australia by Metromatics . For further information, please visit the Metromatics website www.metromatics.com.au or call (07) 3868-4255.